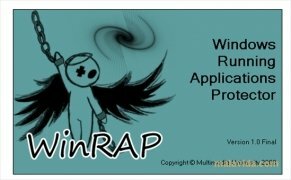 If we share a computer and we don't want anybody to see the applications that we have open when we have to get up for something, or you need to use the PC for something else while you are working and you don't want to risk losing information because you have a program open, you should try WinRAP. 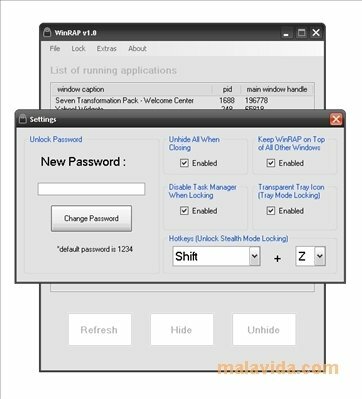 It's an application that allows us to view what applications are open and which ones we want to hide at a specific moment in time, to do so we can select them from a list or simply assign a keyboard shortcut to the program, thus making sure that we only have to press two keys at the same to hide the messaging client or the browser. Another feature that it includes is the one that allows us to hide all the desktop icons or the application's interface, so that we can only view those applications that are open and aren't hidden, a feature that can help us to concentrate on a specific task. Download WinRAP and don't let anyone see what you're doing while you aren't in front of the computer.